Gas has begun to flow along a major new pipeline connecting Russia and the EU. 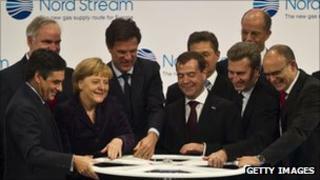 The Nord Stream project was formally opened at a ceremony in Germany attended by Chancellor Angela Merkel and Russian President Dmitry Medvedev. The pipeline allows Siberian gas to flow directly to Germany, via twin pipelines under the Baltic Sea. The new route means Russia can bypass traditional transit countries such as Ukraine and Poland, which have strained relations with Moscow. The pipeline's opening ceremony took place in the Geman town of Lubmin, where heads of state involved in the project opened a tap to release the first of the gas into the European grid. Chanceller Merkel described the project as a "milestone in energy co-operation" and the "basis of a reliable partnership" between Russia and Europe. Although the project will only reach full capacity next year, it is already politically sensitive. Russia is Europe's primary energy supplier, and the new pipeline is likely to increase that dependence. The new route also has strategic implications for Moscow. At present, 80% of Russian gas exports to the EU flow through pipelines across Ukrainian soil, a source of ongoing tension. In 2009, disputes between Moscow and Kiev over the status of this network led Russia to cut off gas to Ukraine during a bitterly cold winter. Poland, another transit country for Russian pipelines, is also in dispute with Moscow over gas. On 7 November, Polish gas monopoly PGNiG filed an arbitration procedure against Russia's gas giant Gazprom to demand a discount on gas imports.